Sales of homes by homeowners rose in September, but prices declined by 9% from a year earlier. Now that gas prices are lower, how much are you driving? NEW YORK (CNNMoney.com) -- Sales of existing homes rose in September, but prices continued to drop, according to the latest reading on the battered housing market by an industry trade group released Friday. The National Association of Realtors reported that sales by homeowners jumped in September to an annual pace of 5.18 million, up 1.4% from a year ago. It was the first time that sales rose compared to a year earlier since November 2005. September sales were up 5% from the August reading of 4.91 million, marking the largest month-to-month increase since July 2003. Economists surveyed by Briefing.com had expected the report to show existing home sales rose to an annual pace of 4.95 million. Though the numbers were encouraging, they do not yet suggest the problems in the housing market are behind us. September's numbers represent contracts signed in July or August - before the mid-September credit crunch tightened the stranglehold on lending and sent confidence in the economy crashing. Sales figures for October and November are likely to reflect this credit freeze. Furthermore, September 2007 was also a particularly disastrous month for the housing market, as the then-emerging credit crunch resulted in a steep dive in sales of existing homes. 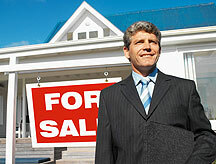 Finally, experts say that foreclosed properties are driving this sales jump. "Compared to a fairly small share of foreclosures or short sales a year ago, distressed sales are currently 35% to 40% of transactions," said Lawrence Yun, chief economist with NAR. "These are pulling the median price down because many are being sold at discounted prices." So it's unlikely that the worst is over. "I think it's premature to say we hit the bottom," said Mike Schenk, senior economist for the Credit Union National Association. "One month of data doesn't make a trend, and there are still some big issues hanging out there." Considering the recent slide in the stock markets, which continued Friday, combined with deteriorating labor markets, escalating debt and a zero savings rate, consumers may be reluctant to buy homes in a market that hasn't yet hit a clear trough. "People are extremely nervous," Schenk said. "When they're nervous, they don't buy things, specifically big ticket purchases." Sales got a boost last month because prices continued to fall. The median price of a single-family home fell 8.6% from a year ago to $190,600. The median price of all homes sold during the month - including single-family homes, townhomes, condominiums and co-ops - fell to $191,600, down 8.8% from $210,500 a year ago. Before the start of the current housing slump, it had been 11 years since prices fell compared to a year earlier. "The housing market is in bad shape in fundamental ways," Schenk said. "The good news is that prices have come down, but the problem is that people expect prices to come down more." As prices continue to fall, potential buyers wait on the sidelines in an attempt to find a market bottom. But with more and more foreclosures on the market, the steep price decline may continue for a while. Thursday, a RealtyTrac report showed that more than 81,000 homes were repossessed by lenders last month, up 104% from September of 2007. The rate of existing home sales rose in every region of the country except the Northeast, where sales slipped by a seasonally adjusted 1.2%. Sales in the South rose 2.2%, while the Midwest saw an increase of 4.4%. The West saw the largest jump in sales, up a whopping 16.8%, as prices fell by 18.5% in that region. Prices in the Northeast declined 5.4%, while the South saw a dip of 4.1%. Prices in the Midwest ticked 7.9% lower. The report offered some encouraging news, with the excess supply of homes on the market falling in September. Realtors estimated that there are now 4.3 million homes available for sale, which represents a 9.9 month supply. That is down from the 10.6-month supply in August. But that number could rise back above 11 months if sales begin to sink again and foreclosures continue to escalate. "The current inventory is reflective of what happened a few months ago," said Schenk. "It's going to take a while to get back to the normal level of about six months."